These are labels that are used to identify products on the shelf in the store. You have them in your home on bottles of shampoo, jars of salad dressing and packages of bakery cookies, and other retail applications. These are multi-color, high quality labels that require a level of expertise that we have. See photos on our Gallery page. These are labels that generally have 2 - 4 colors and are secondarily printed by thermal transfer or laser with additional information such as, ingredients, routing info, safe handling, etc. They can be logistical in nature and may not be seen by the general public but are crucial for the companies that use them. These labels can be found on buckets of icing that are delivered to the Publix and Kroger bakeries, chemical drums, underneath your furniture, on your cup at Starbucks and thousands of other places. See photos on our Gallery page. These are labels that require a consecutive number and/or barcode. They are sometimes run on press and then printed secondarily in our service bureau or may be completed with a mounted unit on press. These labels are generally logistical in nature. They are used in warehouses to keep track of pallets moving through the system, to identify locations, to track your package, and to identify products received at grocery stores and department stores. Variable data labels require specialized knowledge of barcodes, thermal transfer printing and variable data software that we possess. We also have a good working knowledge of RFID (radio frequency identification) labels. See photos on our Gallery page. With the addition of the Colordyne 3600 Memjet technology to our press, short to mid range prime product labels, highly personalized, and in line consecutively numbered are a possibility. This is a great compliment to prime product and variable data — allowing for greater flexibility on short runs and orders with multiple versions. Consecutively numbered, personalized event tickets, test flavors, and start up lines of barbeque sauces and dressings are among our most commonly used digital products. Please visit our Gallery page to watch a very short video to follow a label from project inception to finished product. ART AND DESIGN: New Creation partners with graphic artists and designers on a routine basis. Once your design is finalized our art department will prepare it for production. FTP FILE TRANSFER: Our FTP site provides a secure way to quickly transfer your art files. FULFILLMENT: We will package and ship your labels to your specifications. 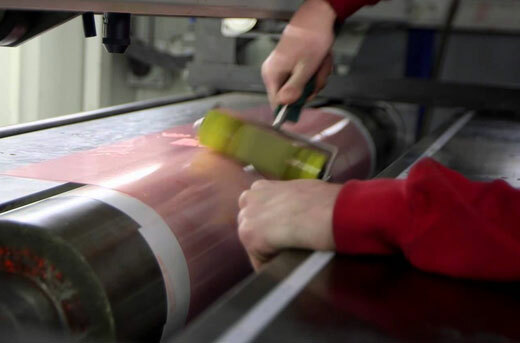 This includes shrink-wrapping, collating, bagging and any special fulfillment requirements. INVENTORY MANAGEMENT: Should you require storage or long-term shipping arrangements of your labels, we can maintain your label inventory and fulfill your orders to your specified drop dates. • Maximum web width = 13"
• Maximum repeat length = 24"